The inkjet printer model is one that most people understand quite well by now. The common analogy is to razor blades, where you pay only a little for the razor head but quite a lot for the razor blades. In the case of inkjet printers, it's all too often the case that just one or two ink refreshes will eclipse the actual cost of the printer body. Epson's latest foray into inkjet printing reverses this trend with what Epson calls "Eco Tank" technology. That's a fancy marketing way of talking about ink tanks as distinct from ink cartridges, which is what every other inkjet printer, including Epson's own still-continuing line of other inkjets use. Setup of the Epson Workforce ET-4550 appears at first to be identical to just about any other inkjet printer we've ever seen. At 51.5x55.8x24.1cm and 7.39kg, it's moderately hefty, but nothing that we overly struggled with in terms of installation. There's the usual tape keeping everything still in the box -- in the case of the Epson Workforce ET-4550 they're bright. But when the time to install the ink, we had a distinctly different job ahead of us. Instead of using small replaceable ink cartridges, the Epson Workforce ET-4550 houses individual ink tanks on the side of the printer. Bundled with the Epson Workforce ET-4550 are the necessary ink bottles. (Black/Cyan/Magenta/Yellow) for multiple years of printing, but before you can strike ink onto a single page, you've got to install the ink. For a regular inkjet printer this would involve slotting a small cartridge into the appropriate slot, but for the Epson Workforce ET-4550 it's a matter of actually pouring the ink into each inkwell. Epson provides instructions on how to pour the ink into each tank. The instructions carefully note that any spilled ink could stain clothes and that you shouldn't drink the ink. Frankly, we feel that if you're inclined to drink the ink, a printer of any type just isn't for you. That aside, the process is equal parts quaint retro and fiddly messy work. As a cautionary step, we donned plastic disposable kitchen gloves before pouring the ink out of each supplied bottle into the Epson Workforce ET-4550. It was a wise step, because removing the silver caps on each bottle will almost certainly put a small amount of ink on your fingers. You've got to pump the ink into each reservoir to get it all out, which is equally fiddly, but thankfully this is a step you should only have to do once every year or so. The side of each ink tank is translucent, so you can easily see exactly how much ink you have. For those who don't like to watch, Epson's driver also provides a digital display within the driver software. Predictably, Epson warns against using non-Epson inks in the Epson Workforce ET-4550. It will be fascinating to see if the third party ink manufacturers do start targeting this kind of space. ble tanks rather than cartridges is that Epson warns you against jostling the Epson Workforce ET-4550 around too much for the very sensible reason that the ink may spill out if you do. If you do need to move it any appreciable distance, it's recommended to pop it back in its original box. From a pure specifications point of view, the Epson Workforce ET-4550 is a multifunction printer covering printing, copying, scanning and even faxing if you're seriously old school in your document needs. It sits at the top of Epson's locally available Eco Tank range with a focus on the small home office user, so it's a little odd to see that the Epson Workforce ET-4550 only supports a single 150 page sheet feeder. Given the Eco Tank's particular mission of printing many pages from its ink tanks, skimping on the paper tray size seems a little odd. The Epson Workforce ET-4550 supports 802.11 b/g/n Wi-Fi for printing via Epson's own smartphone and tablet apps, as well as Apple Airprint, Google Cloud Print, Kindle Fire Printing and the newer Mopria standard. If you prefer your networking in the physical realm, direct 100Mbps Ethernet is supported, as is good old standard USB connectivity. It's slightly annoying that for a printer that costs $699, Epson doesn't include a USB cable in the box. We're somewhat used to that for sub-$100 printers, but for a premium priced model, it feels slightly shabby for Epson to omit a USB cable. Epson rates the Epson Workforce ET-4550 as being capable of printing up to 13 pages-per-minute (ppm) in black and 7.3ppm for colour pages. If you utilise its inbuilt duplexing facility, those speeds drop to 6.5 and 4.5ppm respectively. In our tests, we found a single black page with normal coverage was printed over Wi-Fi in 13.8 seconds, with an average of just over 7 standard black pages printing in a minute, fairly short of Epson's own claims. Coverage on those pages was very crisp, however. A standard 4x6 inch photo took 30 seconds to print on the Epson Workforce ET-4550, which isn't notably sold as a direct photo printer. Epson still sells those, and the Epson Workforce ET-4550's shows why. Printed photos were generally a little dark in tone even in lighter areas of an image. 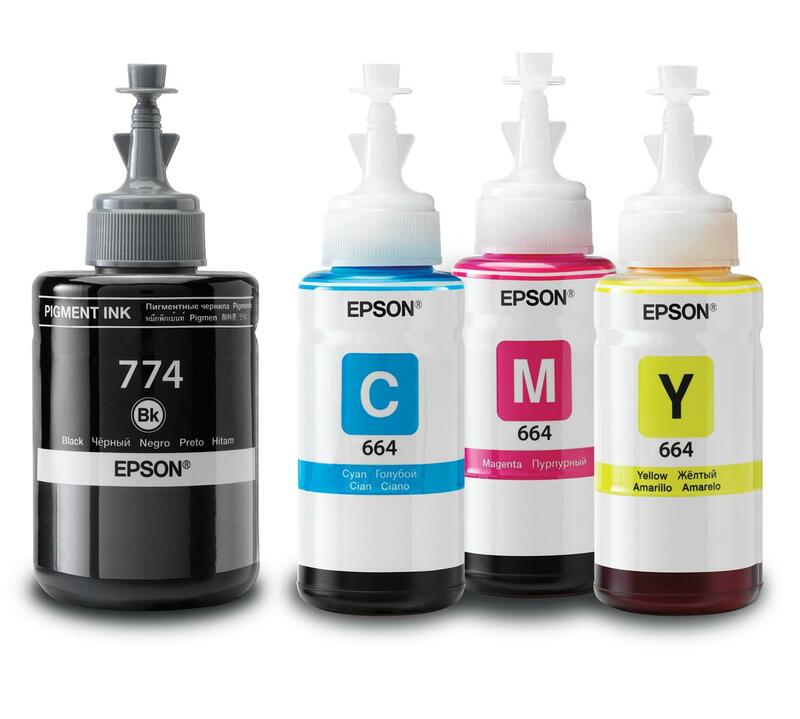 Epson rates the supplied eight bottles of ink that come with the Epson Workforce ET-4550 as being good for around two years worth of printing. With an eye to not delivering this review in 2017, or for that matter unnecessarily printing thousands of pages, we only printed around 200 test pages. Both from the driver and the naked eye viewpoint, there was no perceptible difference in the ink levels after our tests, which bodes well for Epson's output level claims. The point of the Epson Workforce ET-4550 is that it's intended for those who have very particular document printing needs that otherwise become rapidly expensive with conventional ink cartridges. 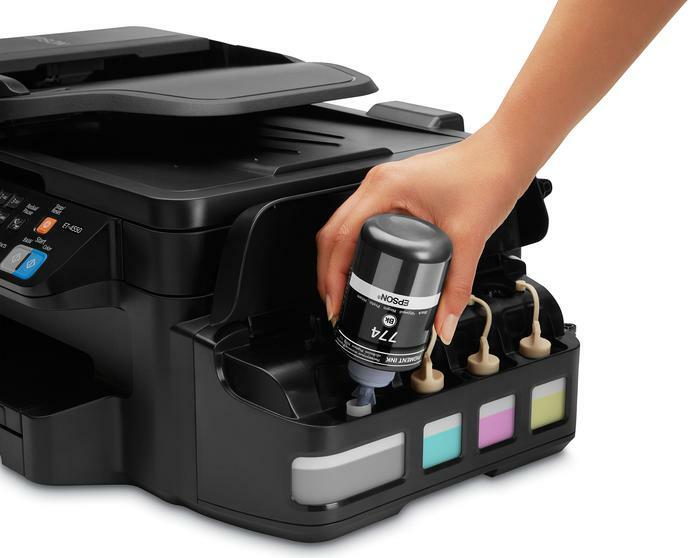 Epson quotes the Epson Workforce ET-4550 as being capable of printing up to 11,000 black or 8,500 colour pages from the eight supplied ink bottles that come in the box with the Epson Workforce ET-4550 printer. Replacement ink bottles cost $16.99 each, save for the slightly larger black ink bottles which will run you $24.99. For some 11,000 prints, that drops the price per page to a very appealing 0.22 cents per page, much cheaper than any other inkjet on the market. The issue here is one of scale. 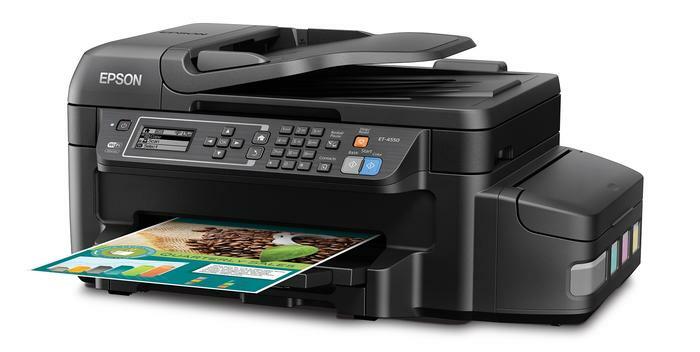 Whereas a traditional inkjet model may only cost you a hundred dollars or so, the Epson Workforce ET-4550 costs a hefty $699. That's a lot for an inkjet printer in 2015 any way you slice it, but it could be a bargain if you know that you're going to approach that 11,000 printed page limit over the course of two years, because you could very easily burn through much more than $699 in inkjet cartridge costs over that period of time. As a straight MFC, the Epson Workforce ET-4550 is perfectly capable, if not particularly speedy. To make it a valuable proposition for you, you've got to be well aware of your overall printing needs. The sticker price is a bit of a shock, but for some small office and home office users, there could be solid value here in terms of the total cost of ownership.